While Regency literature with and without mayhem may be our primary focus it is not our only interest. In fact, as I’m sure you have noticed, we take a particular delight in that dark mayhem that comes with the introduction of creatures of nightmares into a world typically well ordered. Keeping up appearances and reputations is much harder when trying to stay alive and unsoiled by blood. Therein lies the most interesting part of a mash-up novel, challenging the idea that one can maintain proper civility while forced to survive among creatures of violence and brutality. What if history was not as we learned it in school? What if the history books simply left out the part about the vampire scourge? Abraham Lincoln was arguably one of the United States’ greatest presidents. He was the sixteenth US president, credited with abolishing slavery and maintaining the Union during the US Civil War, and died as the result of assassination. At 6 ft 4 in he is also remembered as one of the tallest presidents and for wearing a stove top hat. And while there are many richly detailed biographies of this man’s life, there are none that tell the tale of his vampire hunting. This month we will be reading Abraham Lincoln: Vampire Hunter by Seth Grahame-Smith, who puts the vampires back into the historical equation, fictionally of course. For those who might be interested, and for reasons beyond comprehension not already know, this book has also been made into a movie. Yes, you may want to watch it for comparison’s sake. How does Lincoln balance his vampire hunting with his public persona? What are the vampires up to in America? How does Grahame-Smith blend history with fiction? What do you as a reader/viewer find most interesting with this version of history? 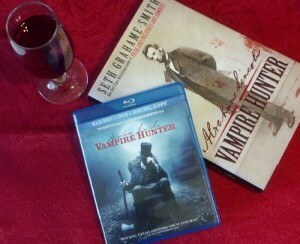 Hoping you read with us, watch with us, and discuss with us as we tackle this blood soaked, vampire infused history.